If you read this blog on the regular, you probably know by now how much I love skincare, and that I’m constantly adding new bits into my routine. 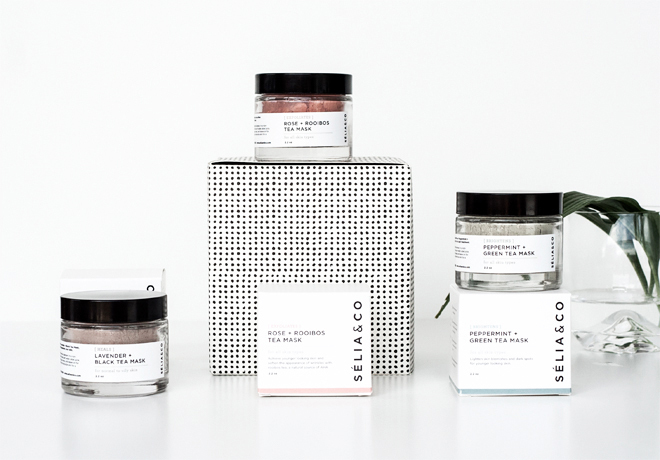 The most recent newbies are this facial mask trio from Selia & Co. I know that some might consider facial masks a non-essential step in their skincare routine, but I take this step rather seriously. Mainly because of the instant results that most masks deliver and, also, I just enjoy pampering my skin from time to time. Selia & Co is a charming green beauty brand that I’ve personally never heard of before they reached out to me, which is no surprise since it’s not mainstream and all of its products are crafted by hand in a small studio in New York. So if you’re into quality, small batch skincare products that are vegan and made with only raw, natural, and organic ingredients – you’ll enjoy this review, I promise. These masks are also cruelty-free, but that should go without saying considering they are featured on this blog. 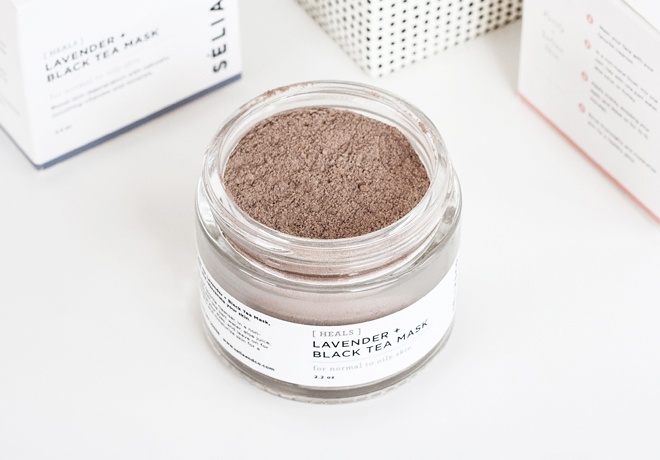 There’s another specific thing that Selia & Co masks have – one of the main active ingredients, along with various natural clays and plant powders, is tea. Speaking of tea in skincare products, we hear a lot about advantages that green/matcha tea brings for acne-prone, oily, and troubled skin, but did you know that, for example, black tea or rooibos might be extremely beneficial as well? I don’t reach for clarifying masks often because my skin usually does not suffer from concerns that most oily skin types experience. However, every now and then I notice some clogged pores in my T-zone (which suggests that my skin type is slowly switching from dry to some combo/dry combination) and I need to use something that would be effective in treating this problem. I keep this Lavender + Black Tea Mask for emergencies and apply it on my nose or straight on a pimple that I’d like to disappear faster; then I use other, usually more hydrating, mask on other areas of my face. The reason why I do this is that my skin gets dehydrated easily, so I find that multi-masking works much better than if I’d use the product for my whole face. 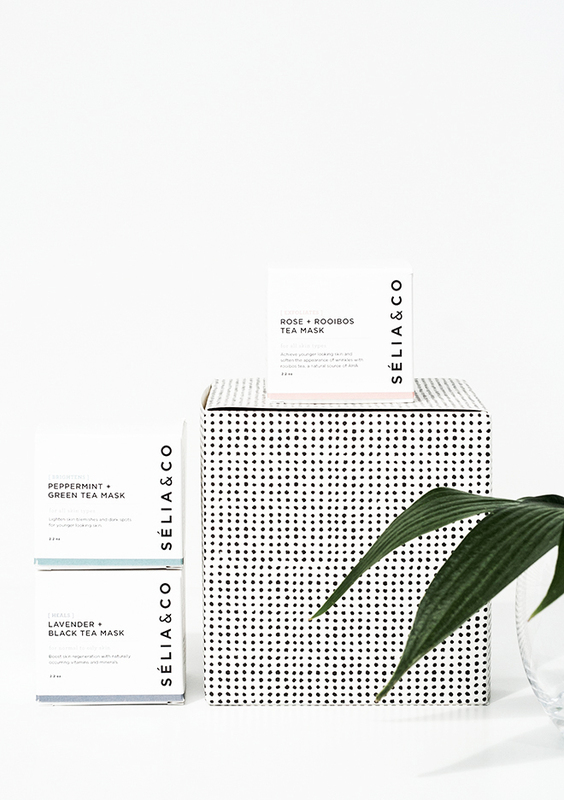 All Selia & Co masks have simple ingredient lists, each consisting of only four ingredients. In this case, there are bentonite and Brazilian purple clays, effective for detoxifying and drawing out impurities. French lavender powder that tones the skin. Also, minerals and tannins in black tea accelerate skin regeneration processes and help to soothe and prevent acne and any unwanted pimples. That’s why this particular mask is recommended for anyone with normal to oily skin type. Every single skin type, from dry to oily to sensitive, can use this mask and benefit well from it. 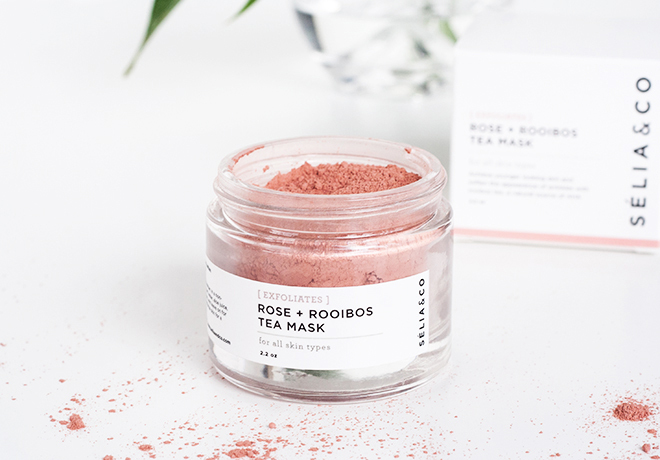 With rose clay to exfoliate and rose and rosehip powders to soothe and soften the skin, it is gentle enough for sensitive/dehydrated skin, but effective enough for skin types that need some intense exfoliating and acne prevention. To be frank, I had absolutely no sense how rooibos tea could impact skin, so I had to google it, and turns out that it’s actually a powerhouse of antioxidants and anti-inflammatory compounds as well as AHA (alpha hydroxy acids), which is a great exfoliant. This is the mask that I use when I want to treat myself by just laying down and relaxing on the couch for 15 minutes at the end of a long, hard day (a girl deserves that, right?) with a bonus that it makes my skin more clear with tighter pores and a healthy glow. I’m usually trying to be careful with ingredients such as peppermint in my skincare products just because of its antiseptic and cooling properties, it might feel a bit tingly, and I have a reactive skin. However, other ingredients in this mask seemed gentle enough, so I was excited to give it a try and see how it works. 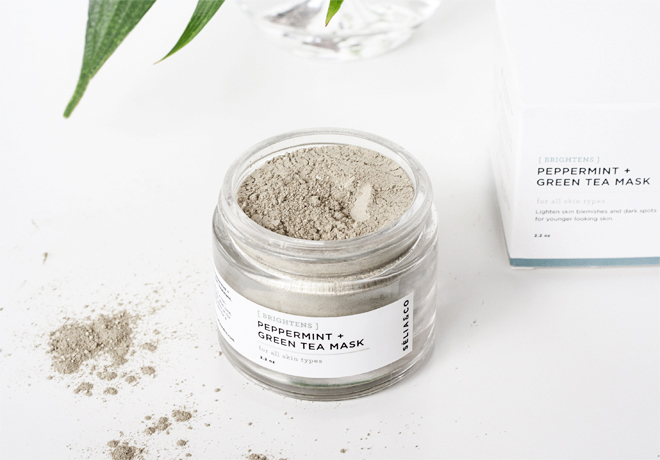 The Peppermint + Green Tea Mask contains white clay as the cleansing ingredient, then there’s the good old antioxidant-rich green matcha tea with its detoxifying and sebum-regulating properties, and the last one is chamomile, which is slightly antiseptic and soothing. I use this mask for my whole face and keep it for 10 minutes or so. It definitely feels a little tingly, but there’s absolutely no redness or any kind of irritation after I remove it. The mask gives me a visibly clearer, brighter complexion, tightens pores, and, most importantly, does not dehydrate my skin. 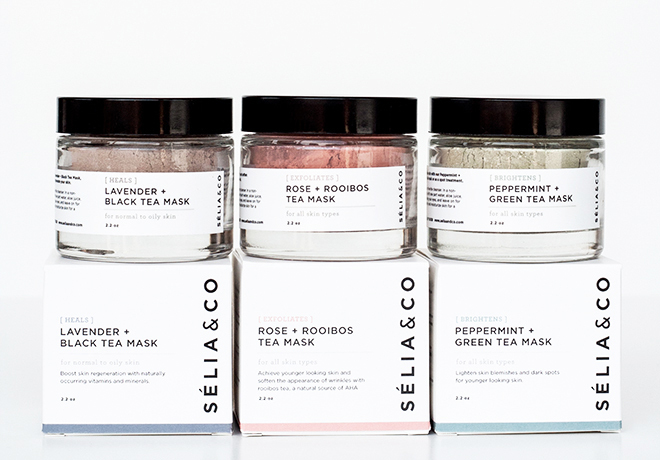 Selia & Co Tea Masks are available online at Selia website for $28/25 for 62g. Have you ever tried facials masks with tea? Have they worked for your skin? I love the look of these so much – minimal and natural. Added to the wishlist! I haven’t tried these products before but after reading your article, I’ll definitey check them out.